Chatbots have been around for some time, but companies have now started adapting chatbot technology from the business point of view. Chatbots are designed to simulate like human conversations. 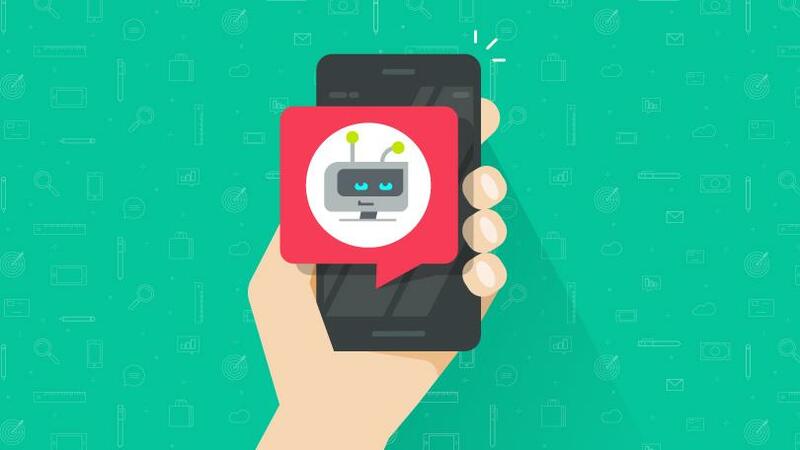 The reason for adapting chatbots for business is very simple as more number of people are increasingly using chat services other than any communication medium. Chatbots can be utilised in various ways, it helps us to shop, provide latest news, schedule meetings, customer service. Chatbots are the perfect medium for people to interact with companies and services. Chatbots are Interactive software that can simulate a human conversation via a chat application such as(facebook messenger, wechat, telegram, slack etc.) which allows businesses to deliver interactive experiences that helps in customer engagement. 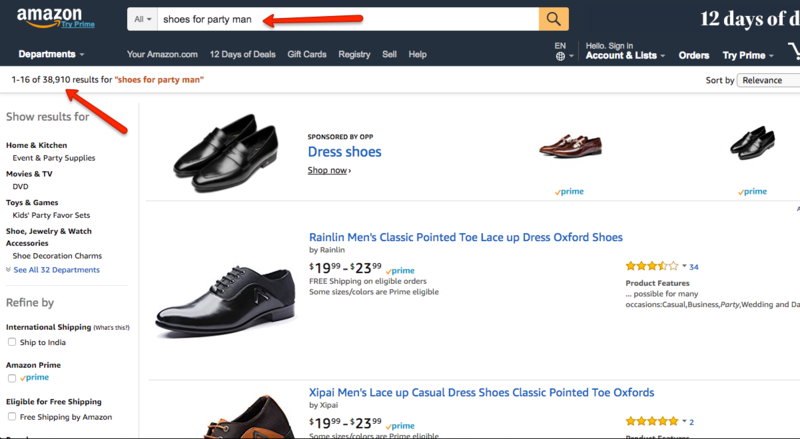 Have a look at the above image, for the search term “shoes for party man”, I got 38,910 results! Yes, of course i can filter based on brand, size, color etc.. but still will end up with 1000’s of results to choose from. Above video shows you an example ecommerce chatbot which we built for the purpose of this article. As you can see, the chatbot is so flexible and you can develop it to make it more personalised for the customer! For whom do you want to buy footwear for? Purpose/Occasion to buy the footwear for? Based on the customer’s answers you can customise the results, and display the products exactly what the customer is looking for, and engage in a better way. This will lead to higher possibility of the customer buying your product. You can also configure the chatbot to display an offer based on how the conversation goes! Compare this with a website which shows a list of endless products. And it’s a known fact that when you give an option to an user to choose from a lot of products, they will end up buying none, because you are giving a lot of time for the user to decide and in many cases they end up confused and drop off. This is where the chatbots are gaining so much attention. Not only will you be able to understand the user behavior, you will also display the exact product they are looking for based on the conversation, which results in higher conversion rates. You can also insert links, cta’s, payments and the possibilities are endless. Whichever business you are in, you can figure out a chatbot that can sell. You can also contact us, and we can help you with it. Over 1 billion messages are being exchanged with businesses every month through facebook messenger. This opens up to whole new way of marketing. You would want to be where your audience are, that’s where chatbots can help you grow your business! That sound’s nice.. But how will you actually make a prospect message you? There are number of ways, you can make a prospect message you..
And when the user replies back you can get their name, email, location, gender and you can add them to your subscriber’s list! The above mentioned points are specific to facebook messenger, but you can also develop chatbots for other platforms such as slack, telegram, wechat etc..
How do these chatbots work? Isn’t it insanely hard to build one? Data driven bots, as the name says are more intelligent. They answer based on the language and intent of the question. More they interact with customers, more they learn and provide better answers. Should you be an expert in artificial intelligence to build a chatbot? No. You don’t have to be an expert. But you need to know the limitations of artificial intelligence currently and do not expect more on the abilities of your chatbot. At present we do not have fully automated bots that interact like human. We can automate simple tasks and personalise it for user.. However, the Artificial Intelligence field is advancing, and you can incorporate certain level of artificial intelligence to your chatbots. Definitely in future, we will be seeing a lot of advanced chatbots. So how to build a chatbot and how difficult is it? Does deploying a chatbot will benefit your business? Start analyzing your business and think about customer relationship management. Business relies on relationship. You have to be where people are present if you want your message to get across and reach larger audience then focusing on messaging platform is really important. You should evolve according to latest business trends to stay on top of your industry. It was great how you explained that chatbots are interactive software that is made to simulate human conversation via chat and engage with customer engagement. That seems like it will help a business very much. It might be a good idea to suggest this to my brother since he plans on starting his own business in the future. Considering that he will start off alone, it makes sense that he gets himself an assistant who will manage customer interaction for him. Thank you for the info. Very well explained and written about chatbots and AI. Not only does Business Administration, but other industries also benefit. A little more business integrations and better customer experience will work out wonders.